One thing I put off for quite a while when I got into Triathlon was a decent triathlon watch. Looking back I should have invested way earlier as I know can’t live without one. I had a computer on my bike – and still do, a decent GPS app on my phone which tracked runs and bike rides but its was a bit of a pain to monitor because you have to keep unlocking your phone to check out how you are doing as you go. I made the plunge and invested in a Timex Ironman GPS enabled watch as an intro and have never looked back. 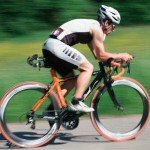 I put this post together to help you decide on the best triathlon watch that suits you and your budget. You could look at different models all day and spend any amount of hard-earned dollars on a set-up so make sure you get the feature set you need to help you track your way to a new PB. Lets now look at some of the most popular triathlon watches available today. Our Best Selling Triathlon Watch is the Garmin vívoactive HR GPS Smart Watch. If you are looking for a watch for your next Tri then the Vívoactive is just what you need. Loaded with features and expert timing this watch will help you on your way to your next personal best. As you get more into triathlon your watch will become a lifeline for you. Just look at any race and you will notice that at the start line all of the serious racers will hit the start button just before they jump into the water. As the race goes on they rely on their triathlon watches to guide their pace, distance and heart rate. This keeps the competitor on track and stops them potentially overdoing it on any of the stages. 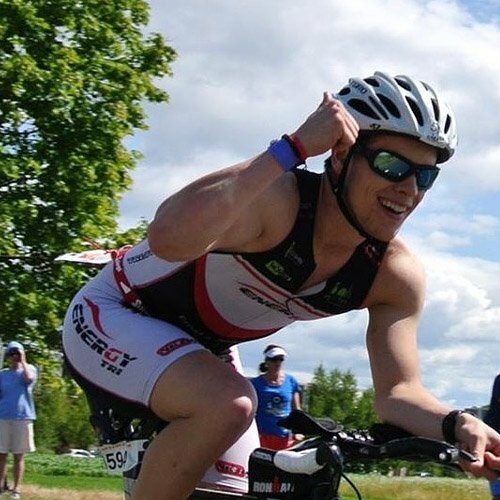 Triathlon timing and data from each race becomes a bit of an obsession so with that in mind you will want the best triathlon watch available to make sure you have everything covered. The Garmin 910XT will become you new best friend on race day. 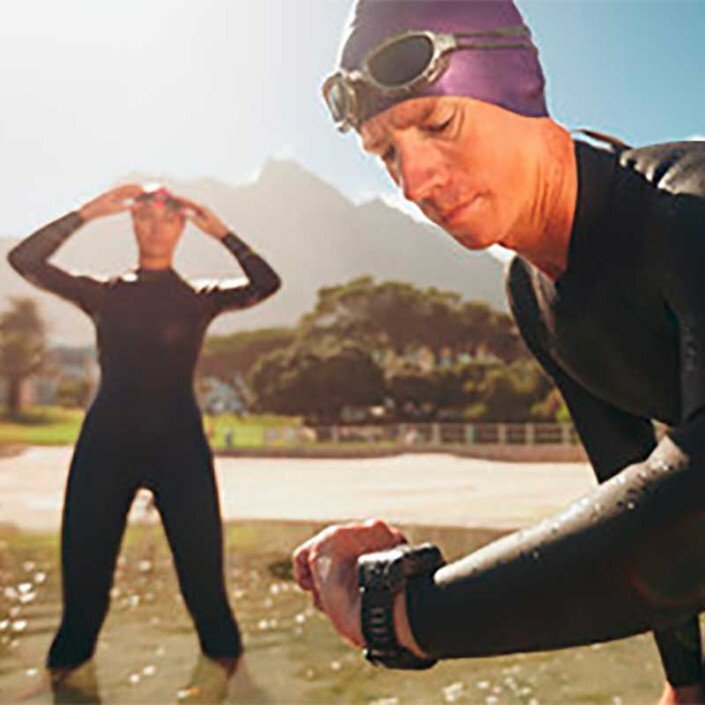 This GPS-enabled device will track swim metrics and distance covered, pace of swimming, running or on the bike, elevation and heart rate. It has an oversized display that is very easy to read while you are racing. 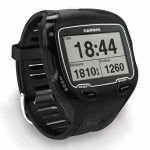 The Garmin 910XT is designed for both pool and open water swimming and is water resistant to 50m. You go any deeper than that and your watch is thee last of your worries. It offers extensive metrics for the swim section of your triathlon race. 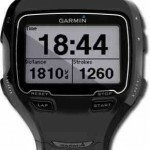 Distance, stroke count, stroke identification and number of lengths are some of the features on the Garmin. It also has the unique ability to gauge your swim efficiency. Because it’s GPS-enabled, the Forerunner 910XT even captures the path you traveled so you can view it later on a map in the Garmin Connect free online community. This feature can help you analyze your open water swimming and adjust your technique as needed. Best Triathlon Watch – One Button Transition. A superb feature is the one button press to transition to your next section of the race. This will save precious seconds when you leave the water or transition from the bike to the run. Many times I’ve seen athletes fumbling with their watches while trying to get to transition. It sports an optional quick release mount that lets you move the 910 from your wrist and mount it on the bike. You can now check your time while hammering down the road at full tilt without lifting your head to look at your wrist. The 910XT is the first in the Garmin range to provide a barometric altimeter providing highly accurate elevation data. This includes ascent, descent and also grade. This multisport device sports many of the features you get in Garmin’s advanced cycling computers so is jam-packed with everything you could need out on the bike. You can also configure vibrating alerts to notify you when to take some nutrition like gels etc. When you hit a split or keep you within range of hitting a pre-planned target or goal. Even with all of these features you still get an impressive twenty hours of battery life so fits in nicely if you are competing at IronMan distance events. If you have a favorite triathlon watch that you can’t live without then let us know and we may add it to the list. We can’t obviously cover off every style here so just picked the ones we feel are top quality for the money. Also we would appreciate you hitting one of the share buttons and spreading the word if you feel that this post on women’s bike shorts is of value to you or perhaps to one of you friends. Thanks for stopping by and happy timing.